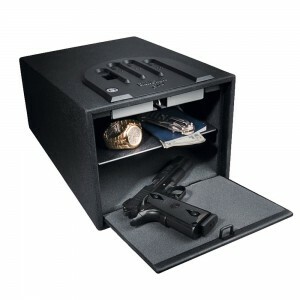 The Gunvault GVB2000 Multi Vault Biometric Gun Safe uses 9V batteries and can store up to 30 fingerprints. The interior of this safe is also lined with foam to protect your firearms and other valuables from nicks, scratches, and heavy impact. The patented No-Eyes keypad and biometric pad make it easy for you to gain quick access, even in the dark. This safe also boasts of a high-strength lock mechanism. According to the manufacturer, even the toughest hand tools will have a hard time cracking this multi vault open, thanks to its precise fittings. There are 22 customer reviews so far on Amazon.com. Reviewers are equally divided, with 11 giving high ratings and the other 11 giving only 3 stars or lower. Door locking system is unreliable – More than a handful or reviewers have already reported that the locking system on this safe has flaws. It turns out that if you don’t close the door forcefully, it will latch without locking. A number of users have reported that minor bumps can cause their safes to suddenly open – definitely a major safety issue, especially in households with young children. Easy installation – Although most reviewers admit that the manual could use some improvement, they claim that assembly of this safe was fairly quick and easy. It didn’t take long to figure out how to put everything together. Reliable fingerprint reader – Satisfied customers were pleased with the highly sensitive and responsive fingerprint reader. According to these reviewers, the safe recognized their fingerprints easily and the safe opened flawlessly almost every time. Easy to use – Reviewers also appreciate how easy it is to program the safe and store fingerprints. Even technophobes will easily warm up to this product and find it a breeze to operate. First off, the good points: According to most users, the Gunvault GVB2000 Multi Vault Biometric Gun Safe has a highly reliable fingerprint reader. The unit instantly recognizes fingertips and quickly grants access most of the time. The controls are also easy to work with. However, there is one common thread among negative reviews that is quite alarming. It seems that a number, or perhaps, possibly all of the GVB2000 units have a faulty door locking system. As mentioned earlier, some Amazon users have complained that the door only latches but doesn’t lock unless you close it with considerable force. This results in the safe suddenly opening when bumped into. For this reason, the product does not score very high on reliability.